Whether it’s a hot meal, light bite or coffee with a homemade cake, Marigold Café offers a wide variety of delicious meals and snacks. Our selection of main courses include our hearty homemade soup & creamy garlic mushrooms on toast. Back by popular demand Booy and Dee’s Spicy Sardines and there was an outcry when we took Double Egg & Chips off so that’s back on. Wahoo! 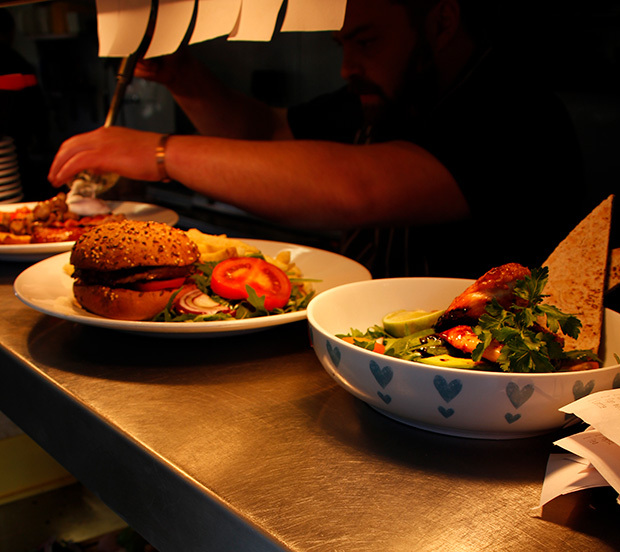 There is also a wide selection of lighter bites to tickle your taste buds along with a choice of sandwiches and sides. For the little ones in the family we have a kids’ menu too. For those of you after something a bit sweeter we offer a wide choice of award-winning ice creams from Yummy Yorkshire… Jaffa Cake, Dime Bar, Eton Mess… the list goes on! Then there’s our cakes – all homemade and baked with love. Our coffee beans are a roasted over in Poppleton by York Coffee Emporium and we offer a selection of teas. Indulge in a luxury hot chocolate or a refreshing Fentimans Elderflower. PIP cartons are available for the kids and for the grown ups we stock local ale from Roosters brewery in Knaresborough. Or be a big kid again and order a milkshake!